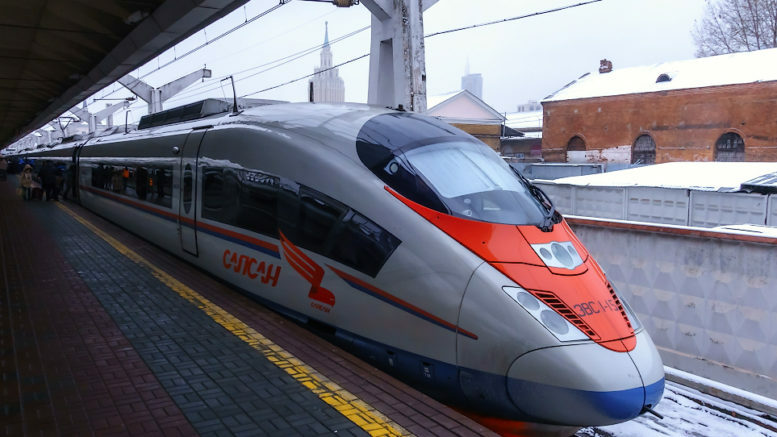 Russian Railways, Siemens and Sinara Group signed a preliminary agreement for the delivery of 11 high-speed trains Sapsan, in addition to 16 of this kind already operating between Moscow, St. Petersburg and Nizhniy Novgorod at a speed of 250 km/h. The signing ceremony took place at the International Trade Fair for Transport Technology in Berlin, and was attended by Oleg Belozerov (CEO Russian Railways), Evgeny Gritsenko (Vice President Sinara), Roland Busch (Board Member Siemens AG) and Zabrina Susson (CEO Siemens Mobility). For the first time, Sapsan will be manufactured at Ural Locomotives, a joint venture between Siemens and Sinara Group located in Yekaterinburg/Russia. The partners launched the company in 2010, with the production of a short-distance train Lastochka connecting Olympic facilities in Sochi or operating as airport express in Moscow and other major cities. The established manufacturing base puts Ural Locomotives in the position to take it to the next level within a short time frame. The plant is equipped with advanced production systems, and the staff has the required experience and competence. Lastochka and Sapsan are both developed on Siemens platforms. The delivery can start as soon as in 2020. It is anticipated that the contract will be executed within 3-3.5 years, and the related service agreement will go for 30 years.